With our Oakville garage door service, we cover all requests of local residents. Our services are not limited to spring repairs or opener inspection. We can fix any part of your residential door despite of its brand, size, weight, or type. From carriage to overhead doors made of steel, wood, or any other material, we can repair and maintain them. 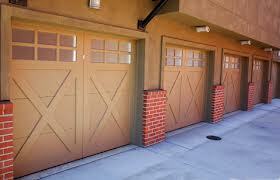 Oakville Garage Door Repair is very experienced in insulated door services and replaces parts as soon as possible. By offering timely repairs and regular services, we aim at keeping your door in Oakville running smoothly and safely every single day. As an experienced garage door service company, we know well that such systems are subject to natural wear let alone damage caused by accidents and elements. So one of the most important services is maintenance. Our goal during such routine services is to eliminate any possibility of future problems which in turn will eliminate any possibility of accidents. In order to do that we adjust, lubricate, align, and fix all parts of both the door and opener. If our technicians come across extensively damaged parts during the routine garage door maintenance, they let you know if there is a need to replace them. However, unexpected problems are not completely avoidable. It only takes fierce weather or bumping with the car in the door to cause some damage. In such cases, count on our quick garage door repair service. We can fix any part, troubleshoot accurately, and provide same day repair. Our techs come equipped to check what happened and the door wouldn’t close or open. Whether we have to replace urgently broken springs or fix the sensors, the job is completed in the first visit and efficiently. With us, you are not just sure about our quick response when you need urgent garage door repair, but also about the effectiveness of our work. All pros at our company are experts in their work, do thorough inspections, and provide timely garage door service in Oakville, Ontario. So call us to cover your repair service needs too.